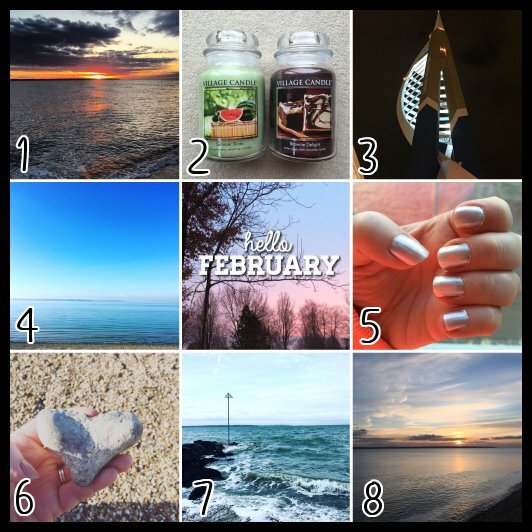 I’m a little late in posting this but here is my roundup of February in pictures. I can not believe it’s already March! It only seems two minutes since Christmas was here but now there’s a definite feel of Spring in the air and I’m so ready for warm evenings and new blooms. February saw some great sunsets. This picture is taken at Stokes Bay, the next bay along from ours. I got two new candles from a local shop with a 25% discount! I’ve never used Village Candle before. Review to follow! In February we went to eat out a couple of times in Portsmouth which houses the Spinnaker Tower. I thought this angle was different to how you would usually see it. There were some gorgeous days in February where we saw sunshine and blue skies. I enjoyed getting out and about! I made a good effort with my nails in February, something which has fell by the way side so far in March. I must try harder! Whilst walking along the beach I found a heart shaped stone. I pocketed it and brought it home to add to my little seaside display in the hall. Despite February having some lovely days there was also strong winds and rain. When I took this photo I was trying to capture the waves crashing in. Usually the Solent is reasonably still. Here’s hoping March turns out to be just as pretty.